Back down here Shannon the earth is soft & green. Small lot by the edge with the drop down gate. Second show is at nine, so we've got time. We'll have Soup 'til the doors open. 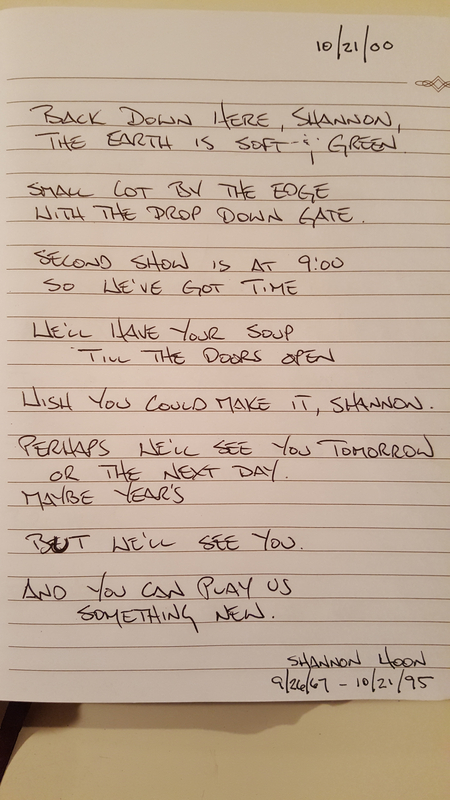 Wish you could make it, Shannon. but we'll see you & you can play us something new. I love this - feels pastoral, comforting, even sentimental. My now-husband and I met in person for the first time on the exact date of your poem's title, having long-distancing it for a year after connecting via this forum. He is the one who introduced me to Blind Melon and the wondrous road of Hoon. Four days later, we saw PJ together for the first time. Magic in spirals.